This is really just a micro version of my introductory post about my research and how I came to write this blog, so if you want a few more details please follow the link above. I also now have a research profile page with detail about my research, my published papers and abstracts and all my contact details, which you can read here. I am a British palaeontologist currently at Queen Mary, University of London. I work primarily on theropod dinosaurs and the pterosaurs focusing on their evolution and ecology, but also on other extinct reptiles within the Archosauria (hence the title) such as birds and sauropods, and on other fields such as biomechanics and sexual selection. I have a degree in zoology, a masters in taxonomy and systematics and a PhD in palaeontology. I’ve spent time working in Germany, China and Ireland. In addition to my research I am very keen on science communication and contribute to a number of other websites as well as running ‘Ask A Biologist’. As for the blog I mainly deal with two themes – extinct archosaurs (that is mostly dinosaurs and pterosaurs in my case) and scientific communication (that is communication between scientists and the public). I also dabble with zoos and museums, practical tips for palaeontologists (both amateur and student) and review the odd bits of work that come my way. In general I try to keep things simple and straightforward and accessible, so don’t expect lots of technical terms, scientific citations or complex graphs. I hope I can bring something for anyone whether they don’t know the front end of a dinosaur from the back or their dinosauromorphs from their dinosauriforms. In practice that means everyone finds this too simplistic or too complex, but there you go. I should point out that all opinions on here are my own and are not endorsed by my current (or any previous) institution. Unless otherwise stated, all images are my own or specifically loaned with permission to use – please ask if you want to use them or link to them. and wanted to let you know that Green Iguanas (and likely other Iguanids) have functional Parietal eyes (I used to keep them as pets), even as those eyes are not as capable as standard eyes. They retain use of this eye throughout their entire lives. I know this isn’t a great way to leave this note, but I was unable to find your email address. Best wishes. Thanks for that. my e-mail is floating around on here in a couple of places (and online in general) and is up on my research page. And you could have just mailed this to AAB as well. Thanks for the comment, but I’ll delete this in couple of days if that’;s OK, as you note, not the best place for this really. Hello, David. My name’s Brendan. Nice to meet you. I’m big fan of Paleontology. I’m really liked your work. I’m on twitter. I work for a science television program from the Netherlands and would like to ask you something about a photograph of a Microraptor fossil. Since I cannot find your emailaddress online, could you email me? Thank you so much for your answer, hope to hear from you soon! I need your help to teach me how to read the phylogenetic tree which i have constructed? Can you please give me your email address so i can forward the tree for your reference? Dear Dave Hones thank you for the insightful conversation at the royal society science fair. I’m currently reading through your publishing’s and have found them to be incredibly interesting. It was great to meet you too and I was genuinely impressed with your knowledge. Glad you like the papers and there’s also over 1000 entries here that might be of some interest. Best of luck for the future. I read your blog every once in a while. And I noticed in your recent post on Archaeopteryx you stated that you don’t have any good photos of the Haarlem specimen. Of course there is no substitute for seeing the real thing. But I have some good detailed photos of it that I took. If you like I can send them to you. Hello Dave. I just wanted to mention that I recently read your book: The Tyrannosaur Chronicles. 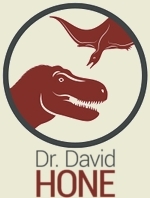 The book was a great read… a really consumable blend of technical and layman language for those of us whose interest is nearly trumped by our inexperience with paleontology. Thanks very much… looking forward to the next one. Fantastic blog, David! I’ve been reading for years. I’m painting a life-sized hadrosaur for a school in Haddon Township, near the location where it was discovered. I was wondering if you had any suggestions for sources of information that would help me create an accurate and informative image. Obviously, I’m especially interested in those fantastic skin fossils. Any suggestions are welcome! Well I’d start with a good skeleton (photos of a real one, or drawings by someone like Scott Harman) to get the major proportions right. Then look at some good art to get a feel for the skin and muscles and general external appearance (eyes, beak, toes etc.) and try to get details where you can. Sorry, all my good hadrosaur skin photos are already on the blog somewhere.